As part of its reform process, Sri Lanka should adopt national legislation governing police use of force in conformity with international standards. The 1978 Constitution of Sri Lanka (as amended through 2015) stipulates in its Article 11 that: “No person shall be subjected to torture or to cruel, inhuman or degrading treatment or punishment.” Surprisingly, the right to life is not included in its enumeration of fundamental rights. There is no regional human rights treaty to which Sri Lanka can become a party. The actions of the Sri Lanka Police are still regulated by the 1883 Penal Code and an 1866 Police Ordinance, as amended through 1984. 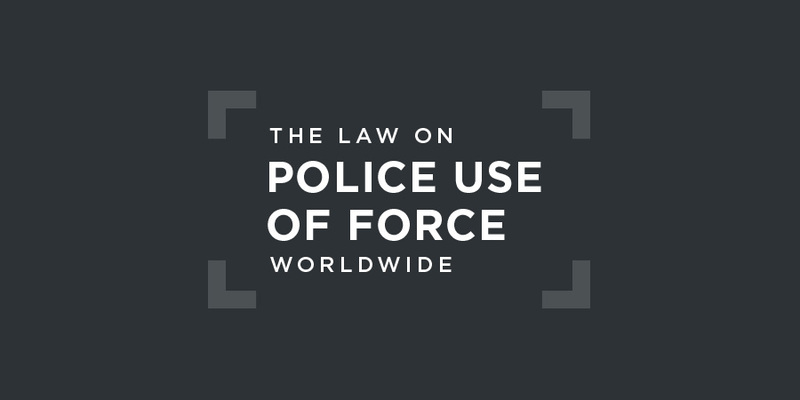 There is no comprehensive national legislation that governs use of force by law enforcement agencies and officers, and that which does exist is woefully out of date. The Penal Code, for instance, specifies that any person who does "any act so rashly or negligently as to endanger human life" shall be liable to a maximum term of three months' imprisonment. To transform Sri Lanka Police into an efficient, transparent and responsive service that, respects and protects Human Rights, ensures Public Accountability and upholds the Rule of Law. The Commission affirms that most of the complaints it receives "are resolved by way of mediation between the two parties". seriously concerned at consistent reports from national and United Nations sources, including the Special Rapporteur on torture, indicating that torture is a common practice carried out in relation to regular criminal investigations in a large majority of cases by the Criminal Investigation Department of the police, regardless of the nature of the suspected offence. The Committee is concerned that the broad police powers to arrest suspects without a court warrant has led to the practice of detaining persons while conducting the investigations as a means to obtain information under duress. The Committee notes allegations that police investigators often fail to register detainees during the initial hours of deprivation of liberty or to bring them before a magistrate within the time limit prescribed by law, during which time torture is particularly likely to occur.Committee against Torture, Concluding Observations on Sri Lanka, UN doc. CAT/C/LKA/CO/5, 27 January 2017, §9. at credible reports indicating that the practice of so-called “white van” abductions of Tamils has continued in the years following the end of the armed conflict. The Committee notes allegations of this practice documented by the Office of the United Nations High Commissioner for Human Rights (OHCHR) Investigation on Sri Lanka during the period 2002-2011 as well as by non-governmental organizations, which have identified 48 sites where torture allegedly occurred or which were used as transit points to torture locations between 2009 and 2015.Committee against Torture, Concluding Observations on Sri Lanka, UN doc. CAT/C/LKA/CO/5, 27 January 2017, §11. The Committee urged Sri Lanka to ensure "that all allegations of unlawful detention, torture and sexual violence by security forces are promptly, impartially and effectively investigated by an independent body" and "that no one is detained in unofficial detention facilities, as this practice is per se a breach of the Convention".Committee against Torture, Concluding Observations on Sri Lanka, UN doc. CAT/C/LKA/CO/5, 27 January 2017, §12. about reports of the unlawful use of force and violations of the right to life by State agents and/or by paramilitary groups, including extrajudicial killings, deaths in custody, enforced disappearances and disproportionate civilian casualties at the end of the conflict. In that context, it is also concerned at the continued lack of effective investigations and prosecutions of perpetrators of human rights violations, including those relating to the 2006 killings that took place in the towns of Muthur and Trincomalee.Human Rights Committee, Concluding Observations on Sri Lanka, UN doc. CCPR/C/LKA/CO/5, 21 November 2014, §14. The Committee called on Sri Lanka to take "all measures necessary to vigorously investigate all allegations of unlawful use of force and violations of the right to life promptly, transparently and impartially, with the aim of bringing those responsible to justice by prosecution and punishment, and provide adequate remedies to victims and their relatives. "Human Rights Committee, Concluding Observations on Sri Lanka, UN doc. CCPR/C/LKA/CO/5, 21 November 2014, §14. Sanjeevan, had been arrested by the Sri Lankan police without apparent reason. When his parents visited him in police custody, he was in poor physical health and he alleged he had been tortured. Four days after his arrest, the parents found their son’s body in the morgue. The previous night, the police had told them to go to the hospital. An inquest concluded that Mr Sanjeevan had died of gunshot wounds. As to the claim under article 6 that the death of the victim is directly attributable to the State party, the Committee recalls that according to the uncontested material the victim was in normal health before being taken into police custody, where he was shortly thereafter seen by eyewitnesses suffering substantial and severe injuries. The alleged reasons for his subsequent death, namely that he died during an LTTE [Tamil Tiger] attack, have been dismissed by the State party’s own judicial and executive authorities. In these circumstances, the Committee must give due weight to the presumption that injury and, a fortiori, death – suffered in custody must be held to be attributable to the State party itself.Human Rights Committee, Sanjeevan v. Sri Lanka, Views (Comm. No. 1436/05), 8 July 2008, §6.2. In the instant case, the State party’s own authorities dismissed the explanation for the victim’s death advanced by the police in whose custody the victim died, and its judicial authorities directed criminal proceedings against the offending police officers. In the absence of any explanation by the State party and in view of the detailed evidence placed before it, the Committee must conclude that the Attorney-General’s decision not to initiate criminal proceedings in favour of disciplinary proceedings was clearly arbitrary and amounted to a denial of justice. The State party must accordingly be held to be in breach of its obligations under articles 6 and 7 to properly investigate the death and torture of the victim and take appropriate action against those found guilty.Human Rights Committee, Sanjeevan v. Sri Lanka, Views (Comm. No. 1436/05), 8 July 2008, §6.4. There is no regional human rights treaty to which Sri Lanka is a party.